It ended very positively the first international mission of 2015 Friends of Stradivari and Museo del Violino in Basel, Switzerland. The delegation was composed of Virginia Villa director general of the Museum of the Violin, by Paolo Bodini President of Friends of Stradivari and Roberto Domenichini owner of the guitar Antonio Stradivari 1679 “Sabionari”. The city of Basel is particularly rich in culture with 40 museums and it is international because in this city musicians from all over the world come to study since the prestige of its music schools as the Hochschule fur Musik and the Schola Cantorum, specializing in early music, merging in Musik Akademie great institution that has more than 2,000 music students. Museo del Violino and Friends of Stradivari were presented to the leaders of the Musik Akademie, with which they were carried out programs for 2016 for an arrival in Cremona of the best students of the classes for strings. 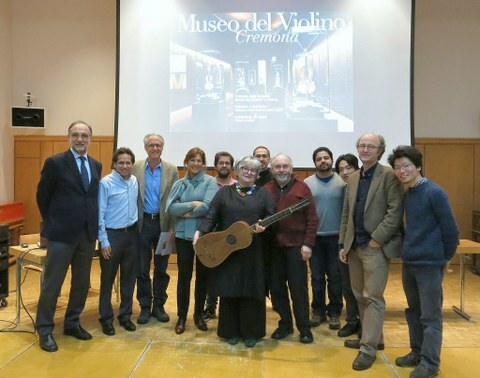 In addition to the presentation of the exhibition “Guitarorama – from Stradivari to Stratocaster”, Museo del Violino and Friends of Stradivari were presented to important personalities of the city of Basel. The guitar Antonio Stradivari in 1679, “Sabionari”, belonging to the collection Friends of Stradivari, is now on display until April 26 at the exhibition “Guitarorama – from Stradivari to Stratocaster” in Musik Museum in the Historisches Museum in Basel. The guitar was presented at the Musik Akademie with a concert of Krishnasol Jimènez who performed music by the seventeenth century contemporaries like Robert De visée Stradivari and Angelo Michele Bartolotti. Moreover, the two restorers French Françoise and Daniel de Ridder Sinier illustrated the strategy and the details of their restoration of the guitar performed in 2011. At the end a specific session with the guitar was organized, dedicated to musicians who teach guitar to Musik Akademie and experts of baroque music. The event was attended by lutenists of global importance as Hopkinson Smith and Anthony Bailes.